Q: What have you got against this Boulez guy any way? A: Nothing. He is a fascinating personality, a true sympton of the paranoia and abuse of power that defines our modern era. I don't think he has lived up to his idea of destroying art of the past. Q: Isn't Boulez an internationally recognized genius? Hasn't he won 17 Grammy awards? Who are you pass such a judgement against this man? A: Guess who wrote "We need to restore the spirit of irreverence in music."? Q: Is this a joke? Are you serious? A: This is not a joke, although you may of course laugh at it. I am serious. A: Uh, I don't think so, but talk to your lawyer or accountant about this (and ask them to donate while you are at it). Q: Will donating to the project jepodize my chances of working at IRCAM? A: Probably (if anyone over there would notice this project, which I don't think is likely). You can always keep your donation anonymous. Q: Aren't you afraid that Boulez will retailate and ruin your music career? A: No. However, I do dream of Mr. Boulez donating recordings of his works that he has since withdrawn or modified or which no longer meet his approval. Q: Didn't John Cage compose a piece like this? A: No. There is a somewhat humorous story in Cage's landmark book Silence about a club he formed called Capitalists, Inc. in which one had to smash 100 records to join (and then become President of the club). I am not sure if Cage was serious about this, or just being funny. Does anybody know if Cage really did form such a club? Regardless, I envisioned this project before consciously recognizing Cage's story, but when I do realize this project, I will then join Capitalists, Inc. as President, and anyone who donates to this project will be included in my esteemed Cabinet. Lucky you. Q: When will you do the project? Q: Is Boulez still alive? A: You may check his current status here. Q: Wasn't Boulez just arrested for being a terrorist? A: No. Boulez was apprently detained by Police because someone had made a death threat to a music critic using Boulez's name. This incident occurred years before his brief detention. No charges were pressed and a formal appology was issued to Boulez. Read this for more info. Some news sources incorrectly reported that his detention was in regards to another infamous statement that the opera houses of the world would be better off blown up. This statement was made before his employment with the Paris Opera. Q: Where can I see a photo of Boulez touching his chin while gazing at Ligeti? 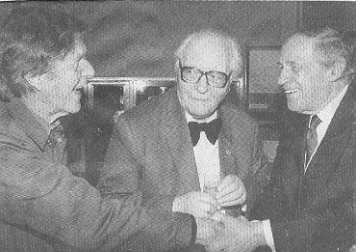 Q: Where can I see a photo of Boulez gladhanding John Cage while Oliver Messiaen cringes with trepidation? Q: Where can I see a photo of Boulez glaring at Stockhausen for not wearing a tie? Q: What is Boulez's favorite movie? Q: Where can I locate further information about Pierre Boulez? A: Look at my Links page.